Guess what – crate training may be for you! 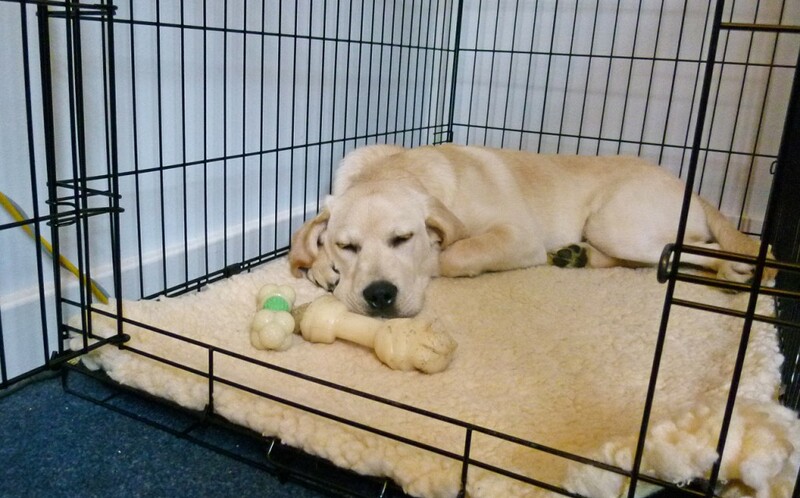 The first thing to know about crate training is that is isn’t for every dog. Some dogs do NOT like being confined, and that is A-okay. Always remember that forcing your dog into an uncomfortable situation could lead to further difficulties… so rewards, praise, and confidence-boosting is always the way to go. 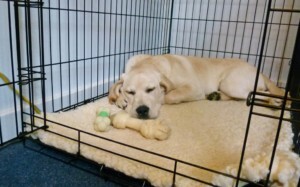 Before we begin, I’d like to dispel a few myths about crate training. Firstly, it is often thought that keeping a dog in a crate is cruel or mean. To be clear, dogs should not be crated for too long, as they need the opportunity to use the bathroom, exercise, and stretch. These needs vary based on specific dog temperament and age. 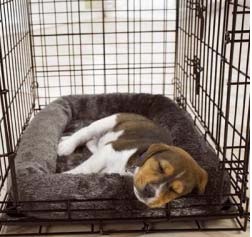 If your dog is in the proper size crate (to be discussed later) and has a midday break, crating is acceptable and often necessary for certain dogs. Secondly, crating is NOT a punishment. 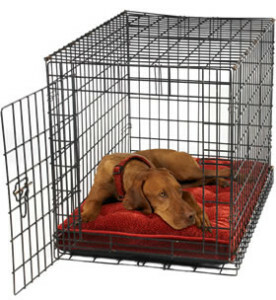 The crate should be revered as a happy and relaxing place for any dog, not a place to ride out punishment. 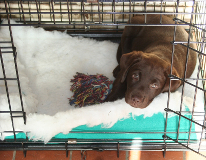 Thirdly, many people believe that crating is only for puppies, and dogs should grow out of it. Quite the opposite is true actually! Many dogs come to love and feel comfortable in their crates. They see crate-time as a safe haven, and look forward to a relaxing rest. 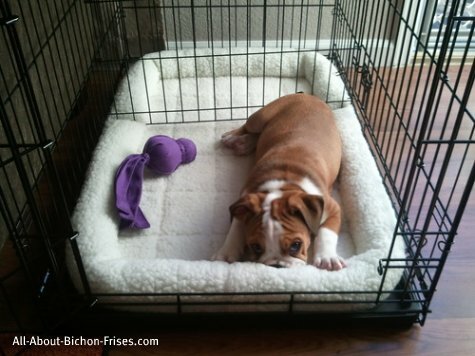 Crate training is applicable to dogs of any age. Okay on to the fun stuff! So you’ve decided to crate train your dog: what’s first? First, you get to choose a crate. I personally am a fan of the large, wire, double-door crates because they allow the pup so see what’s going on around them and provide good airflow. They are also incredibly easy to clean, and difficult for dogs to chew on. Be sure to do your research and choose a crate that works for your needs and for your dog. The crate should be large enough for the dog to stand all the way up, and turn circles in both directions. If you are puppy training, you don’t want a crate that is too large, as the puppy may feel encouraged to soil the crate. Puppies should have enough space to move around, but not so much that they can soil one end, and then escape from their mess on the other end. 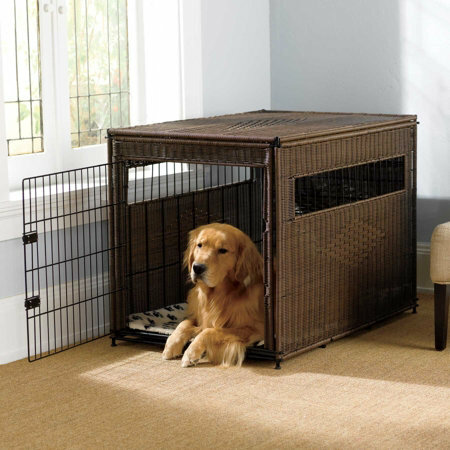 Next: set your dog’s new crate up in a quiet area of your home. Make it a cozy place full of soft blankets or a bed, lots of fun toys, and yummy treats! This is your dog’s new “place”, so come up with a name for it, and make it consistent. Some viable options are: “night-night spot”, “place”, “den”, or just plain ol’ “crate”. Now the real work begins! Full disclosure: crate training can be a lengthy process for some dogs, and super short for others. Each dog is an individual so exercise patience and stay positive. Step one: Once you have the crate set up, introduce it to your dog. Use a happy voice, and drop high value treats and toys in and around the crate. This is the dog’s first impression of a potentially scary cave, so don’t introduce it too abruptly. Continue with the positive associations for as long as it takes to get the dog to enter the crate voluntarily. Once they do so, give extreme praise! The key is to give high praise when the dog enters the crate, and do nothing when they leave. They will learn to associate positive things with the crate in no time. Step two: begin feeding your dog meals in the crate. Note, this step is really only relevant for food-motivated dogs. If your pup isn’t super interested in food, you can put the bowl near the crate so they still see it when they go to nibble. If that is the case, continue with toys and high praise as in step one. Step three: begin closing your dog in the crate. Once your dog enters the crate voluntarily, close the door. Use your key “crate” word, so they understand what is expected of them, and associate place with word. Start with a very short amount of time, and slowly extend the time as your training sessions go on. If your dog whines, wait until they are silent before you open the door. You definitely do not want them to associate whining with being let out! Again, be sure to give big praise when they enter the crate, and ignore them when they leave it. Step four: crate your dog for longer periods of time. You should do this step both while you are home, and while you are away so they do not associate the crate with being left alone. Begin by closing the door for 20-30 minutes and see how your dog does. You can leave the house, or even just go in another room. 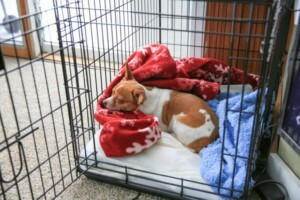 Start with small amounts of time, and slowly extend them as your dog gets used to the crate. Say your “crate” word, close the door with an unemotional exit, and leave the room without a fuss. When you return, stay low-key so you don’t mimic their excitement. If you are using a crate to help potty-train, be sure to take your dog directly outside when you let them out of the crate. This lessens the chance they will go potty inside! Step five: crate your dog at night. Be sure to give your dog the chance to use the bathroom right before going in the crate. If you have a puppy, or a dog with a small bladder, it may be a good idea to take their water bowls away a few hours before bedtime. It is recommended that dogs sleep close to their owners, whether it be in the same room, or in the hallway right outside, as studies have shown that it enhances the bond between owner and dog. However, you have to do what is best for you and your dog, as well as what works in your home. So keep that in mind when you choose a spot for your dog’s crate in step one! If your dog whines when they go in the crate, ignore them until they stop. If they don’t stop, and you think they may have to go to the bathroom, try using your “potty” phrase. If they get excited, take them out on a potty mission, and then they go right back in their crate, no muss, no fuss. Unfortunately, you may just have to grin and bear it for the first few nights! You can also try playing a radio with soothing music or even white noise to help lull your pup to sleep and make them feel as though they aren’t alone. So, let’s say you’ve gone through all these steps, given your dog time, patience, and positivity, and they still aren’t loving the crate? There are a few options here. Firstly, if your dog is potty trained and doesn’t chew up your house, you may just want to forget the crate. Some dogs just don’t like being confined, and that’s alright! If your dog is not potty trained or does chew up your house, try confining them to a dog-safe room instead of a crate. This could be a good compromise to you keeping your house clean and your dog happy! Secondly, if your dog panics it is time for you to leave, they may be struggling with separation anxiety. 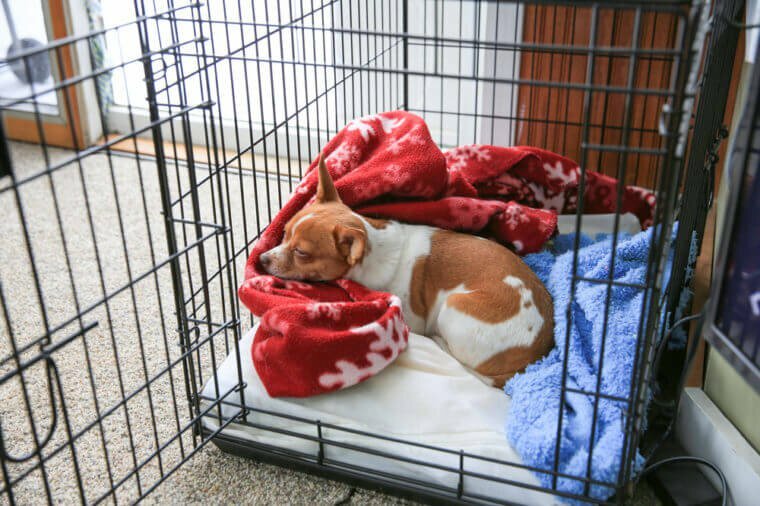 To be clear, a crate is NOT a substitution for dealing with separation anxiety, and a dog who does suffer from it can get quite injured if crated. Separation Anxiety is a serious behavioral condition that requires the attention of an animal behavior professional. A crate is not a band aid for anxiety, potty training, or destruction. It is a tool to help with your training process, not a substitution. That being said, it is great to be able to give a dog a relaxing place for them to hang out, and of course, it is always fun to teach your dog a new trick! If you are interested in crate training, or have questions about positive training techniques for any behavior, contact our trainer at [email protected].